The Penticton Vees have signed Okanagan Hockey Academy alumni Greg Brydon to help out their depleted D-core. Dec. 6, 2016 3:00 p.m.
No Griffin Mendel. No Jonny Tychonick. No James Miller. Add Gabe Bast and maybe Mitch Meek to that list. The latter two on the Penticton Vees blueline have missed games to injury, while the former are in Leduc, Alta. for the Team Canada West camp for the World Junior A challenge from Dec. 4 to 8. Forward Jamie Armstrong is also out of the Vees’ lineup with mono until after Christmas. Meek might be available on Wednesday when the Vees host the Vernon Vipers for a battle between BCHL Interior Division rivals. The healthy defenceman are Joey Leahy and Kenny Johnson, along with some affiliate callups. 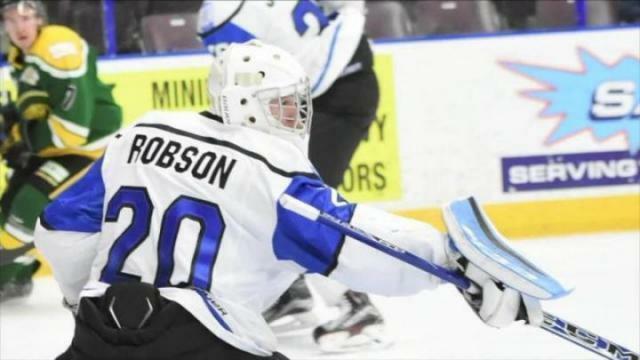 Harbinson eased some of the blueline problems on Tuesday by signing Penticton product Greg Brydon, an alumi of the Okanagan Hockey Academy. Brydon, 18, started the season with the Powell River Kings, playing in 18 games and picking up one assist to go along with 23 penalty-minutes. Brydon was briefly with the Campbell River Storm of the Vancouver Island Junior Hockey League before landing in Penticton, and picked up a goal in his Storm debut over the weekend. Brydon spent the past three years at the OHA. To add Brydon, the Vees placed Bast on injured reserve. Harbinson said the depleted blueline is a key reason getting the two points on Saturday was important. Leahy said nothing changes when it comes to the challenge the defence faces. To be ready for the Vipers (15-12-3-0) the Vees have focused on small details. Things they will do differently on the forecheck and making sure they are battle ready. “They’re good, obviously,” said Vipers coach Mark Ferner, while away on a scouting trip in Phoenix, Ariz. when his team defeated the West Kelowna Warriors 6-1. “They’ll work and we gotta be good and make sure our details and habits are good. “We talk about them, but really all we’re concerned about is how we play,” continued Ferner. The Vipers have a new goalie in Darion Hanson, a Union Dutchmen commit, who has allowed two goals in 200 minutes of action. Rookie goalie Ty Taylor is at the Team Canada West camp. Steven Jandric is on fire for the Vipers right now with seven goals in his last six games, while Christian Cakebread is clicking with Ryan Brushett and Niko Karamanis scoring two goals in the West Kelowna win. The Vipers obtained defenceman Cameron Trott from Salmon Arm for Carter Stephenson and possesses a bomb from the point. The Vipers also added defenceman Connor Clouston from the Medicine Hat Tigers. He was a victim of the numbers game with too many 20 year olds. Puck drop on Wednesday’s game is 7 p.m.